A wonderfully zany and offbeat tale set in the American Midwest. Story blurb: Written in the language of the period, this vivid and utterly transfixing love story between two men is set in the nineteenth-century American Midwest. Douglas Fortescue is a successful poet in England who flees the country for America following an Oscar Wilde-like scandal insinuating sexual impropriety; Joshua Jenkyns is a feral young outlaw who was taught how to shoot a man at age six, and who, against the wishes of his father, teaches himself how to read, a skill that then unleashes a world of possibility beyond that which he knows. The two men meet when Joshua robs Douglas’s carriage and takes him hostage; soon, a remarkable secret is revealed, and these two very different men grow closer, even as Douglas’s brother tries to “save” him from his uncivilized surroundings. Missouri was first published in Germany to wide acclaim. 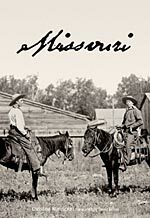 Now available in English for the first time, Missouri is destined to become a gay men’s camp classic for its earnest, romantic reinterpretation of a time and place in American history traditionally closed off to gay readers. “Missouri” by Christine Wunnicke [Arsenal Pulp Press; Tra edition, 2010] is a story that either pleases or displeases; there is very little middle ground shown by its critics to date. Therefore, I will have to say that I liked it. I found it wonderfully zany; offbeat; and unlike any other gay, American Western tale I have every encountered. Douglas Fortesque is an ambitious court clerk in northern England, and not just a little bit of a con man. He therefore lets his hair down (literally), dyes it black, starves himself until he has that gaunt, poet-like appearance, and pens utter gibberish to the wild acclaim of an effete London literary society. Indeed, the more outlandish he becomes the more acclaim he receives from a pretentious, gullible public. Eventually tiring of this masquerade he retires to the country, but legitimacy only makes him less interesting and also vulnerable to his critics, and in a thinly veiled allusion to Oscar Wilde’s persecution he escapes to the United States where his brother wishes to buy property. Meanwhile, Joshua Jenkyns, the young, slightly psychotic half-breed offspring of a notorious American outlaw is terrorizing the Midwest, learning how to read and becoming enamoured by the disjointed words of one, Douglas Fortescue. In a bizarre turn of events, therefore, these two unlikely characters cross paths and Fortescue is hurried away on horseback to become Jenkyns’ coddled hostage. Thus begins a process of assimilation whereby Fortescue is stripped of his pretentions, and Jenkyns of his savagery, until they meet in an ethereal love-making scene that is beautifully understated by the author. Any other approach—graphic for example—would have cheapened it. One of the criticisms that has been leveled at this novella is that it is too short (134 pages) to develop a complex story of this nature; and I agree that it could have been longer. However, in those 134 pages Wunnicke has developed two very unforgettable characters, a unique love story set against a stark, primeval wilderness, and an outcome that is totally unpredictable.